John Kirk Singlaub (born July 10, 1921) is a highly decorated former OSS officer, a founding member of the Central Intelligence Agency (CIA), and a retired major general in the United States Army. In 1977, Singlaub was relieved from his position as Chief of Staff of U.S. forces in South Korea after criticizing President Jimmy Carter's proposal to withdraw U.S. troops from the Korean peninsula in an interview with the Washington Post. Less than a year later, Singlaub was forced to retire after publicly questioning President Carter's national security policies. In 1979, Singlaub founded the Western Goals Foundation, a private intelligence network that was implicated for supplying weapons to the Contras during the Iran-Contra affair. Singlaub has contributed to several books and written an autobiography. Singlaub was born in Independence, California, on July 10, 1921. After graduating from Van Nuys High School in 1939, he attended the University of California at Los Angeles. After graduation, he received a commission as a second lieutenant of infantry on January 14, 1943. As a member of Operation Jedburgh (Singlaub was part of the three man team codenamed "JAMES"), Singlaub parachuted behind German lines in August 1944 to work with the French Resistance fighters or Maquis groups that had swelled the resistance ranks after the D-Day invasion during World War II. He headed CIA operations in postwar Manchuria during the Chinese Communist revolution, led troops in the Korean War, managed the secret war along the Ho Chi Minh Trail in the Kingdom of Laos and Vietnam, worked with the Contras in Nicaragua, and Afghan resistance during the Soviet invasion of Afghanistan. 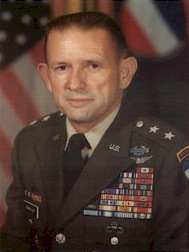 In 1977, while Singlaub was chief of staff of U.S. forces in South Korea, he publicly criticized President Jimmy Carter's proposal to withdraw U.S. troops from the Korean peninsula. On March 21, 1977, Carter relieved him of duty for overstepping his bounds and failing to respect the President's authority as Commander-in-Chief. Less than a year later, Singlaub again publicly questioned President Carter's national security policies, this time during a lecture at Georgia Tech, and was forced to retire. The U.S. Army Special Operations Command presented its first John Singlaub Award in 2013 for "courageous actions ... off the battlefield." After retiring from the army, Singlaub, with John Rees and Democratic Congressman from Georgia, Larry McDonald founded the Western Goals Foundation. According to The Spokesman-Review, it was intended to "blunt subversion, terrorism, and communism" by filling the gap "created by the disbanding of the House Un-American Activities Committee". Prior to the collapse of the Berlin Wall and Marxism-Leninism in the Soviet Union in 1991, Singlaub was founder in 1981 of the United States Council for World Freedom, the U.S. chapter of the World Anti-Communist League (WACL). The chapter became involved with the Iran–Contra affair, with Associated Press reporting that, "Singlaub's private group became the public cover for the White House operation". The WACL was described by former member Geoffrey Stewart-Smith as allegedly a "largely a collection of Nazis, Fascists, anti-Semites, sellers of forgeries, vicious racialists, and corrupt self-seekers." Singlaub is credited with purging the organization of these types and making it respectable. U.S. Army General William Westmoreland described Singlaub as a "true military professional" and "a man of honest, patriotic conviction and courage." Congressman Henry J. Hyde (Judiciary, Foreign Affairs, and Intelligence Committees), described Singlaub as "a brave man, a thorough patriot, and a keen observer"; someone who had been "in the center of almost every controversial military action since World War II." Active for 40 years in overt and covert operations, he had private and secret interviews with many military and government leaders worldwide. He personally knew William Casey, Director of Central Intelligence during the Reagan Administration, as well as Oliver North, and was involved in the Iran–Contra affair. Singlaub was President Reagan's administrative chief liaison in the Contra supply effort to oppose Moscow's and Fidel Castro's advances in El Salvador and Nicaragua during the Cold War and their support for armed Marxist revolutionary guerrilla movements. Through his chairmanship of the world Anti-Communist League (WACL) and its U.S. chapter, the U.S. Council for World Freedom (USCWF), he enlisted Members of the US Congress from both political parties, Washington, D.C. policymakers, retired U.S. military officials, paramilitary groups, foreign governments, and American think tanks and conservatives in the Contra cause. He often met on Capitol Hill with members of the U.S. Congress, including Congressman Charlie Wilson (D-TX) about U.S. support and funding for the Contras and anti-communist resistance forces in Afghanistan opposed to the Red Army invasion of Kabul in 1979. As of 2014, he lives in Franklin, Tennessee. He is a member of the advisory council of the Victims of Communism Memorial Foundation. Singlaub is the honorary vice president of London's Special Forces Club. He is the chairman of The Jedburgh Group and president of the non-profit organization America's Future, Inc. The Coalition to Salute America's Heroes, which was founded by Roger Chapin, named Singlaub to its board of directors in 2008. Singlaub was paid $180,000 by the charity from 2009-2011. The New York Times critiqued the organization as a money-maker for its founders rather than for veterans, described it as an "intolerable fraud" and "among a dozen military-related charities given a grade of F in a study last December by the American Institute of Philanthropy, a nonprofit watchdog group. These and other charities have collected hundreds of millions of dollars from kind-hearted Americans and squandered an unconscionable amount of it on overhead and expenses — 70 percent or 80 percent, or more." The Attorney General of California sued the charity in August 2012 for "more than $4.3 million regarding allegations of fraudulent fundraising, self-dealing and excessive executive compensation." The lawsuit was settled in September 2013. According to the charity's 2013 federal tax return, Singlaub resigned from its board of directors in January 2013. Hazardous Duty. Summit Books, 1991. ISBN 0-671-70516-4 (Autobiography with Malcolm McConnell). ^ "Carter / Singlaub | Vanderbilt Television News Archive". tvnews.vanderbilt.edu. Retrieved Feb 10, 2019. ^ "ARMED FORCES: General on the Carpet". May 30, 1977. Retrieved Feb 10, 2019 – via content.time.com. ^ Persico, Joseph E. (August 4, 1991). "His Dog Tags Don't Come Off (Book Review)". New York Times. Retrieved 24 June 2015. ^ "USASOC Red, Black Ball presents first Maj. Gen. Singlaub Award". U.S. Army. ^ "RightWeb Group Watch profile". Retrieved Feb 10, 2019. ^ McManus, Doyle (September 16, 1985). "Rightist Crusade Finds Its Way Into Spotlight: Led by Retired Gen. Singlaub, Anti-Communist League Is Funnel for Private Funds to Contras" (fee required). Los Angeles Times. Retrieved 2008-10-08. ^ "Election officials warn of letter questioning registration of cats, dogs, the deceased". WAVY. September 27, 2016. ^ "Biography of Major General John K. Singlaub". Coalition to Salute America's Heroes. ^ "Guidestar compensation report for the Coalition to Salute America's Heroes" (PDF). Guidestar. ^ "California AG Sues Veterans' Charity". The NonProfit Times. August 10, 2012. ^ "Attorney General Kamala D. Harris Announces New Leadership, Restitution for Help Hospitalized Veterans Charity". State of California Department of Justice, Office of the Attorney General. ^ "2012 IRS Form 990 for the Coalition to Salute America's Heroes Foundation (page 7)" (PDF). Coalition to Salute America's Heroes. Wikimedia Commons has media related to John K. Singlaub.